Mothers and Sons, Terrence McNally’s new play, is a very emotional show as it moves from funny to sadness and back again through the course of its 90 minutes. The play revolves around a mother, played to perfection by Tyne Daly, making an unexpected visit to the New York apartment of her late son’s partner, played (again, perfectly) by Frederick Weller. The visit comes nearly 20 years after her son’s death and she’s confronted by the live her son might have had as she finds that Cal is now married to Will and they have a young son, Bud. McNally tackles some tough topics here. Kathryn, the mom, lost her son to AIDS in 1994. She’d never really embraced his life in New York and his partnership with Cal and 20 years later she hasn’t fully come to terms with his death either. For Cal, the visit brings up the past–how much he loved Angelo and how difficult taking care of him in his last days had been. Cal’s husband, Will, fully knows about Cal’s past and what he went through, having Kathryn in their home bringing up the past is difficult for him. Bud, meanwhile, often manages to cut through the adult tension with some well placed comments and questions. It’s difficult to discuss the play without giving away some of the stunning moments. It’s easy to imagine that this very scene could’ve gone down in countless homes where sons and partners were lost to AIDS. McNally’s writing is sharp as he navigates the push and pull for the characters as they struggle to be polite even while emotions overwhelm them. The cast portrays this flawlessly. Daly is amazing as she runs through so many emotions, truly showing the difficulty for parents who outlive their children. For her there’s more devastation because Kathryn and Angelo weren’t close because she had issues with him being gay. Weller, who we saw years ago in Take Me Out, goes on his own journey too as he remembers his love from so long ago and the anguish of living through the early years of the AIDS epidemic. Bobby Steggert, one of our favorite actors who we recently saw in Big Fish, has the smaller role here as Will, but he still impresses as he defends his family from the woman who has brought chaos into the home. As Bud, Grayson Taylor epitomizes childhood innocence throughout the show and gets to provide a very emotional coda. 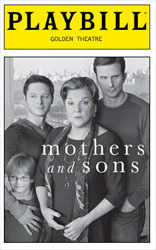 Mothers and Sons finishes previews this week and officially opens on Monday, March 24. If you’re in the city, it’s highly recommended that you see this extraordinary play with this fine cast. With the show still in previews, there aren’t images and video available, but here is a great behind the scenes clip, featuring McNally and the cast.